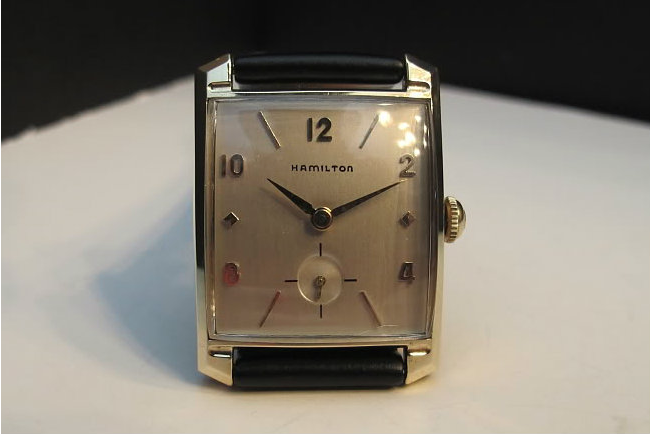 In 1955 Hamilton introduced the 22 jewel 770 movement. This 12/0 sized movement is highly regarded as the best movement that Hamilton ever produced. It continued to be manufactured in Lancaster PA until 1969. From 1958 through 1961, Hamilton produced the Chapman, featuring the 770 movement. It was part of the "Medallion" line up. 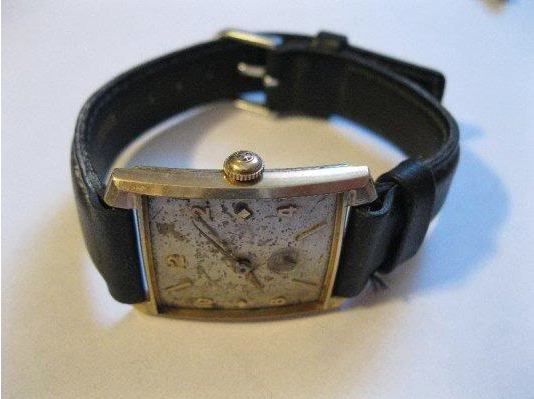 Hamilton also had a "Masterpiece" line of solid gold watches and a "Medalist"series of gold filled watches. I imagine the Medallion series was a step up from the Medalist series. It's hard to say though, as Medalist watches were still a premium level versus Hamilton's other less expensive rolled gold plated models. 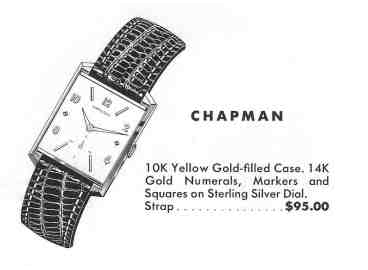 Anyway, the Chapman came in a 10K gold filled case with solid 14K numerals and markers on a sterling silver dial. It's a very clean, classic 1950's design in my opinion. Here's a Chapman that I received as a wreck and was able to restore to it's former glory. As received, it had lost it's crystal and had developed a serious case of "dial rash". In addition, the hands were very corroded and needed to be replaced (although they can be refinished too). With the case nicely polished, a new set of hands, a nice glass crystal installed and professionally refinished dial - this Chapman was a thing of beauty. And here's a wrist shot of it. It really is too bad the 770 movement is no longer being built. What a fantastic piece of engineering, design and craftsmanship. Sometimes, I wonder why Sea-gull (Tianjin?) has not cloned this movement and cased it ala retro military, Vietnam era. The Chinese have been doing some fine work lately, as much as I hate to admit it. Before I get my head ripped off here, what I was thinking of is an homage copy, not a fake. I am not aware of there being any US companies left that are able to tool up and manufacture a copy from top to bottom and profit from the investment. Why buy an homage when you can find the real deal? Of course, Hamilton has produced "registered editions" of some vintage watches but in the end they are just inspired copies of what is essentially a finer watch. I would like to see a company, Chinese or other, make a quality quartz version of the Electric 505 so that all of the Electric models can be given new life. They will surely all stop working eventually, as they typically require replacement parts during the overhaul process and those parts are no longer made. I suppose getting a Chinese company to produce the necessary replacement parts (contacts, etc) would work too... but a perfect, drop in replacement that could use the same dial, hands, crown, and what-not. would be great. 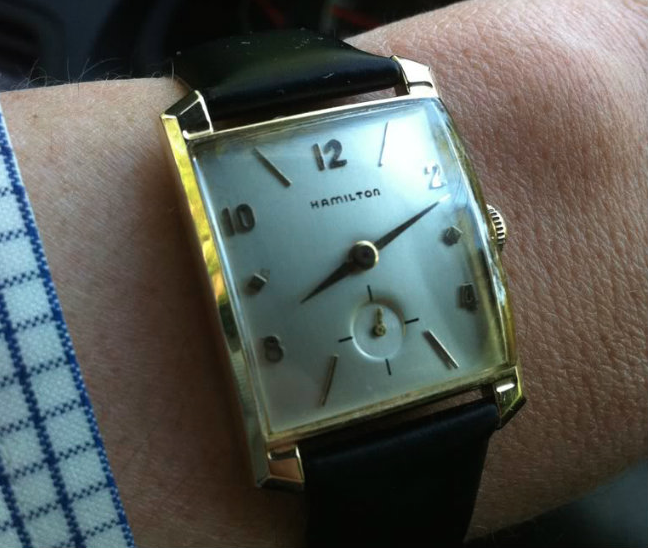 As a kid, I got a new-old-stock Hamilton Chapman for my birthday a few years after it was no longer made. Picked it right off the local jeweler's shelf. Back then, it was common to find NOS pieces a few years and even a few decades old, sitting right there for the taking. Been looking for a nice one without the usual case wear. Great job!